Bubble or air-in-line detection is a common lab automation application. In these types of applications it’s important to know whether or not liquid is flowing through a line to ensure safe and proper function in liquid-handling processes. As these processes utilize smaller and smaller volumes of liquid — which provides cost and time saving benefits — it becomes more and more difficult to detect the potential air pockets forming inside the line. The most common approach in detecting these minute air pockets is a through-beam, photoelectric bubble sensor. 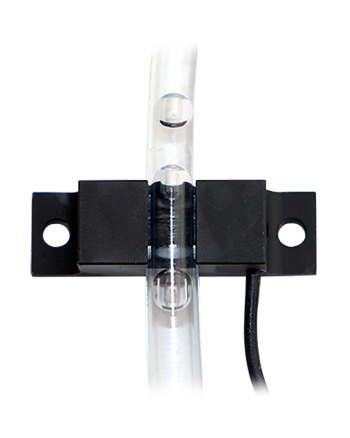 Photoelectric bubble sensors provide non-invasive detection of fluids and air pockets residing inside a tube. They have fixed opening dimensions for standard tube sizes allowing the selected tube to sit in perfect position between the sensor’s optical components. When the sensor’s light beam is blocked by fluid (or an air pocket) inside the tube, the received signal varies and external electronics determine if the signal variation is above or below the set threshold. Once the threshold is met the sensor’s output is switched. Because a tube acts as a lens for light to travel it’s important to factor in the tube diameters. If there is a large difference between the outer and inner diameters of a particular tube, the outcome is a relatively large tube wall. A large tube wall will allow light rays to travel from the emitter through the wall straight to the detector without passing through the inner diameter of the tube, where the liquid or bubble is present. This causes unreliable detection. By accounting for both the inner and outer tube diameters a proper determination can be made in selecting what type of sensor to use to ensure that light only passes through the inner diameter of the tube and not through the wall. Since photoelectric tube sensors operate on the principle of light detection, light must make it through one end of the tube and out the other end. Therefore, the transparency of the tube is critical. If the tube is opaque a photoelectric sensor solution is unlikely; however, in some cases it’s possible for a photoelectric tube sensor to detect through an opaque tube. The liquid type(s) and transparency are critical when determining which photoelectric tube sensor to use. If the liquid type is non-aqueous, without factoring in its transparency, it’s best to use the principle of light refraction through the liquid. If the liquid type is aqueous and is completely transparent or semitransparent, it’s best to use the principle of light absorption through the liquid. 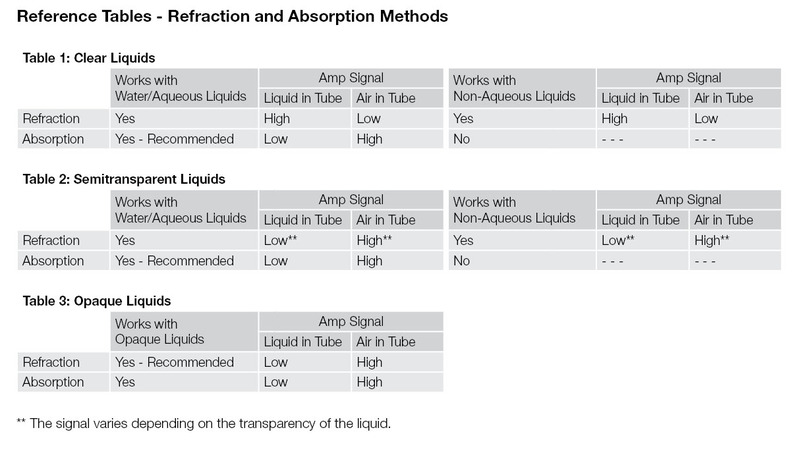 The following table will help determine what type of sensor to use with respect to the liquid type present inside the tube. Since the type of applications that require precise bubble detection range in specifications from the use of hundreds of different liquids to specialized tube dimensions, this post only touches the surface of the photoelectric sensors for bubble detection. For more information on tube sensors, please visit the Balluff website. Tim Vacca has experience and knowledge of the industrial automation industry with Balluff. With his product and industry knowledge, he is sharing his passion for automation with Automation Insights. Hello, we have a Balluff subsidiary in India that can work with you to supply this. You can contact them at info.in@balluff.in or by phone +91 22 25 56 80 97. Thank you. Good article, concise and well presented. With Bio-pharmaceuticals in a growth curve, should see good sales. Bob, Thank you for the kind words! We are pleased to know that this article was beneficial to you. Previous PostPrevious Which cable jacket is best for your application? Back to the Basics – How do I wire my 3-wire sensors? What is a Capacitive Sensor? Flush or Non-Flush - What's the Difference? Which cable jacket is best for your application? Back to the Basics: How Do I Wire a DC 2-wire Sensor?